We have decided that we will not be doing the puddle jump (across the Ocean to the South Pacific islands) this coming April. We've got things to do and lots to learn before we feel comfortable beginning a journey that could take years. Next summer we have to deal with Connie's rental house in Tumwater and we want to spend another October bringing in the California crop on the farm. Since we are too young to start receiving social security we think it best to take lucrative employment when it is offered and the work in CA is not only profitable but it's fun! Another cruising year will surely make us one with the boat and Traveler should be as ready as she can be for an extended cruise in 2015. As for this cruising season, we are putting together our cruising plans right now. 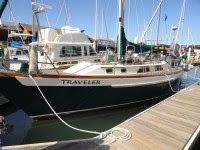 Mid November we'll leave Mazatlan and sail south. We'll have room to carry a couple of passengers so if you want to join us for a week in Mid November then fly on down to Mazatlan and we'll make some scenic stops in Isla Isabella, San Blas, Matanchen, Chacala, Punta Mita, La Cruz and Puerto Vallarta (PV); get on the boat in Mazatlan, fly home from PV. Then the next cruising opportunity will be there in Banderas Bay where we'll be for a few weeks to a month in December and/or January. 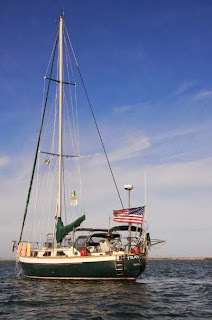 There are numerous cruising opportunities in and around that big bay. Fly into PV then out of PV. Next, In January and/or February we'll round Cabo Corrientes and head south to Chamela, Tenacatita, Barra de Navidad, and Manzanillo. This is one of our favorite areas. Fly into PV and out from Manzanillo if you join us for the trip down the coast. Or fly in and out of Manzanillo to enjoy Tenacatita and Barra where we'll be taking our sweet time enjoying the warm water, sandy beaches, and easy living. In February or March we head further south to Ixtapa / Zihuatanejo and maybe on to Acapulco from there. In the spring we start north again to the Sea of Cortez (La Paz, Loreto, all those beautiful islands and beyond) before taking the boat over to San Carlos in June for summer storage. 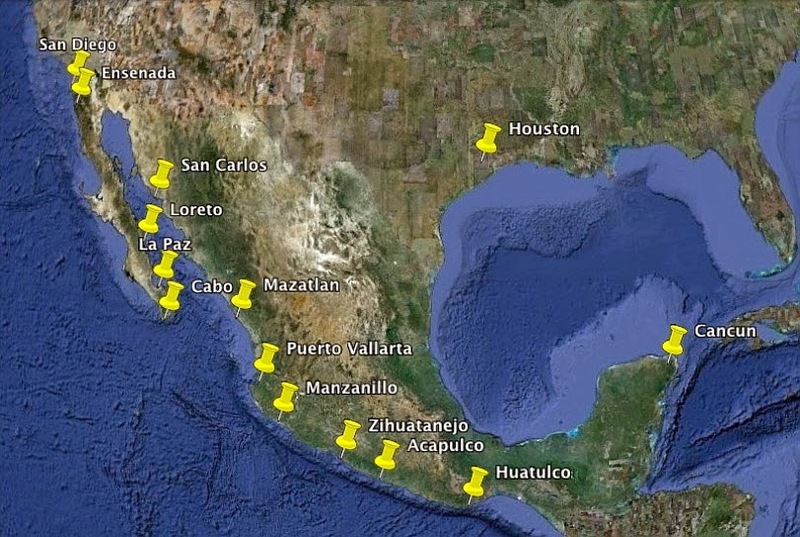 So seriously, I know some of our friends have been mulling over the idea of joining us for a week or so on the Mexico coast this winter so if this is you, drop us an email and we can talk about timing and location. You'll have to arrange a flight. Other than that all you need is a passport, swim suit, shorts, sandals, Hawaiian shirt, and some pesos. I've got a list here of some of the airlines that fly in and out of the area. We like to use Alaska Air but the others will do nicely. Connie and Scott had a grand time working on the farm up there in Mendocino county. We were there about five weeks and came away healthy and happy with the cruising kitty refreshed and our minds at ease. Our little Dolphin RV made it back down the rough road into the valley and across Jerry Brown's state of California to Reno Nevada where we picked up three new solar panels at The Inverter Store. There is snowed and we knew it was high time to high tail it south to lower elevations and higher temperatures. We traveled south through Bishop CA then turned east into Death Valley National Park where, sure enough, it warmed up more and more so as we approached then went below sea level. Down in Furnace Creek (elevation minus 190 feet) the air was so thick and heavy that we didn't need to breath. Oxygen entered through our pores and the Dolphin seemed to swim through the viscus atmosphere. We got caught in traffic in Las Vegas and found a chilly campsite in Zion National Park. From the north rim we drove out to Page Arizona and on to the the Grand Canyon where we stayed at the Mather campground. 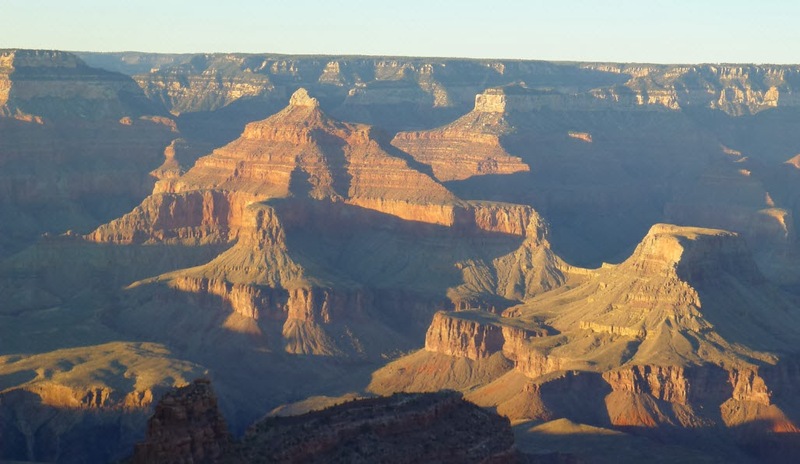 The Grand Canyon is most impressive but seeing it from the top, from many similar viewpoints it soon started to look the same. And so we drove south, loosing altitude and gaining temperature until we arrived here in Phoenix. Back to the solar panels we bought in Reno...... Feel free to skip this little tech talk piece and scroll down a page. The specs? AIMS model PV120poly, 120 Watt, 6.86 amps, 17.49 volts Pmax, measuring 48.5" x 26.3". These should just fit on top of Traveler's dodger where the five old panels used to live. Altogether that gives me 360 watts. Amps = Watts / Voltage right? so 360 / 12 equals 30 amps. That means that if they are in full sun and producing full power then we've got 30 amps per hour coming into the battery bank. How many darn amps does a simple sailor need, fer dog's sake? Let's add it up! Now these are just rough figures and don't account for the charging that will happen when we run the diesel engine. 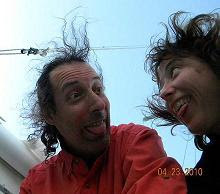 If the three solar panels leave us energy short then we have room on the stern of the boat to hang another panel. I've got two Blue Sky 2512iX regulators that can handle 25 amps each so another panel will be no problem. But we will wait and see if these three do the job before I go constructing another platform on the taffrail. Given the space restrictions on top of the dodger I needed to find smaller panels than the norm of 60 inches long and I wanted something a little more heavy duty to take the stress of a marine environment. 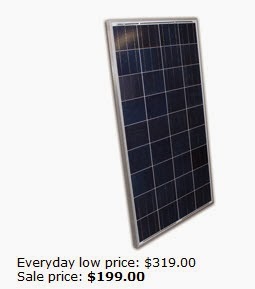 These panels are a little bit more costly per watt than some but they should serve our needs nicely. Enough tech talk for now. We are currently in sunny Phoenix, in possession of a long list of provisioning items. In Fort Bragg we traded for some scuba equipment and now lack only two tanks, some weights, and a wet suit to complete our two outfits. We'll find gear here in town. 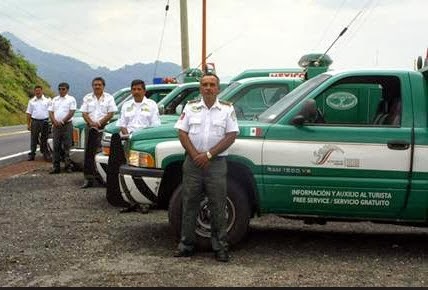 Once in Mexico we'll try to find a way to get our dive certifications so we can practice diving this winter. We'll definitely want to be comfortable below sea level when we go to the South Pacific in a year or so. And we'll be practicing on the SSB radio now that we have a radio license. Knowing how to download weather forecasts and keeping in touch via email is a learning priority this year. We'll be buying lots of packaged food items here in Phoenix. Most bulk food items are not legal to bring into Mexico so we'll wait on those. Of course we'll bring in the maximum amount of tinto vino. 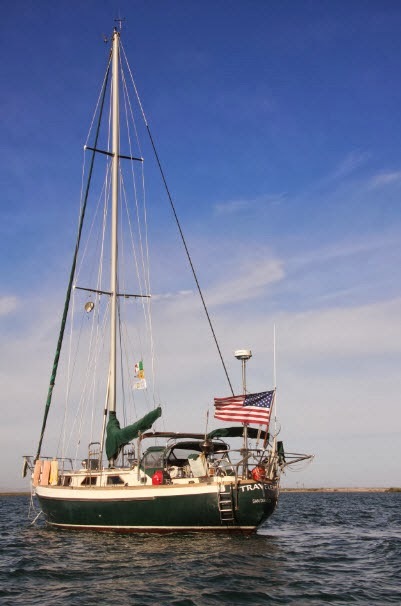 We'll be visiting the West Marine store for a couple of handheld VHF radios and some other nautical gear and there is some hardware we want to find there. Then in a few days we'll be driving across the border at Nogales, stopping in San Carlos overnight then continuing on to Marina Mazatlan to rediscover our dear Traveler. Speaking of plans... see our next post for details on where we are headed and when and how you might come visit. 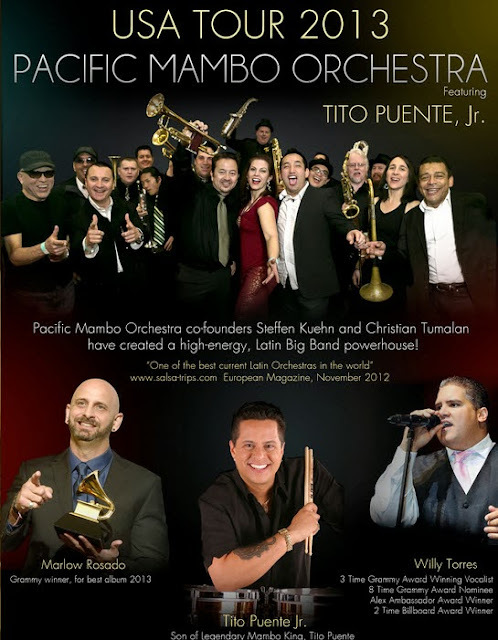 We saw the Pacific Mambo Orchestra last night at the Scottsdale Center for the Performing Arts. Nice!